Nora Nolan grew up in Maplewood, NJ and learned to push comedy boundaries growing up in a large Irish Catholic family where, in order to get a word in edgewise, you had to lead with an edgy punch line, which she spent years refining. 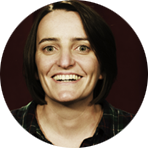 Nora earned her chops as a stand-up comic in NYC and Washington D.C. before moving to LA, where she can now be seen performing stand-up and improv. Nora co-wrote a sitcom pilot Written Off, which was an Official Selection at the 2016 New York TV Festival and has written several digital series for production company Whalerock Industries (formerly BermanBraun). Nora is currently a staff writer on Trial & Error (NBC).